The Itikaf is the annual ten day seclusion which takes place in the last ten days of the Holy Month of Ramadhan. This practice is optional for Muslims and can be performed alone or collectively. It is an advance form of self purification and spiritual uplift which takes the performer into a domain which is not in the scope of fasting which is a lower form of this spiritual venture. Collective Itikaf is performed all over the world with the most famous venues being the Masjid al-Haram in Makkah and Masjid Nabavi in Madinah. The collective Itikaf is the Sunnah of the Prophet (SAW) and holds higher reward and benefit. The collective Itikaf performed by the Holy Prophet SAW in Masjid Nabavi with the Sahabah was a unique spiritual training camp which consisted of the Holy prophet (SAW) lecturing, teaching and practically training the Sahabah with special regards to gaining a high spiritual status. 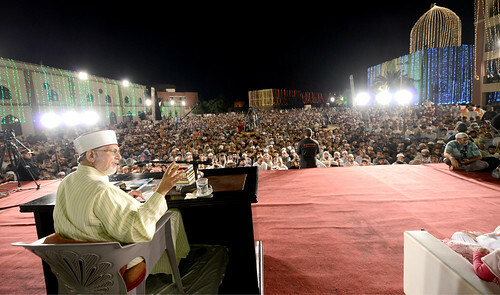 The Collective Itikafs present in the world today, are only considered to be collective due to the large numbers of people performing the practice at one venue. They do not possess the attributes of the collective Itikaf which was performed by the Holy Prophet (SAW). The annual collective Itikaf organised by Minhaj-ul-Quran International in Lahore is based upon the collective Itikaf model of the time of Holy prophet (SAW). The ten day Itikaf is organised as a spiritual training camp with the main features of the Itikaf being the lectures and sittings of Shaykh-ul-Islam Prof. Dr. Muhammad Tahir-ul-Qadri. Together with the practical methods of advancing ones spiritual status through various sequences of the remembrance of Allah which those in the Itikaf adhere to under the guidance of Shaykh-ul-Islam. Thousands of men and women take part in the MQI collective Itikaf every year who travel from the lengths and breadths of Pakistan with scores making a special journey from around the globe. Having the opportunity to perform the collective Itikaf in the company and spiritual guidance of one of the greatest Sufis and Shaykhs alive is a privilege which attracts drove upon drove of worshippers. The collective Itikaf is used by MQI as a training camp to spiritually charge individuals to prepare them to carry out the Islamic propagational work of MQI.